Mastering the Coping Course DVD-ROM — Saavsus, Inc. Designed by Dr. Paul Rohde and colleagues, this interactive training program provides a unique, personalized training experience for educators and mental health professionals who want to improve their skills in helping depressed adolescents. Until now, training in this effective, evidence-based program has been limited to in-person workshops or printed guides. 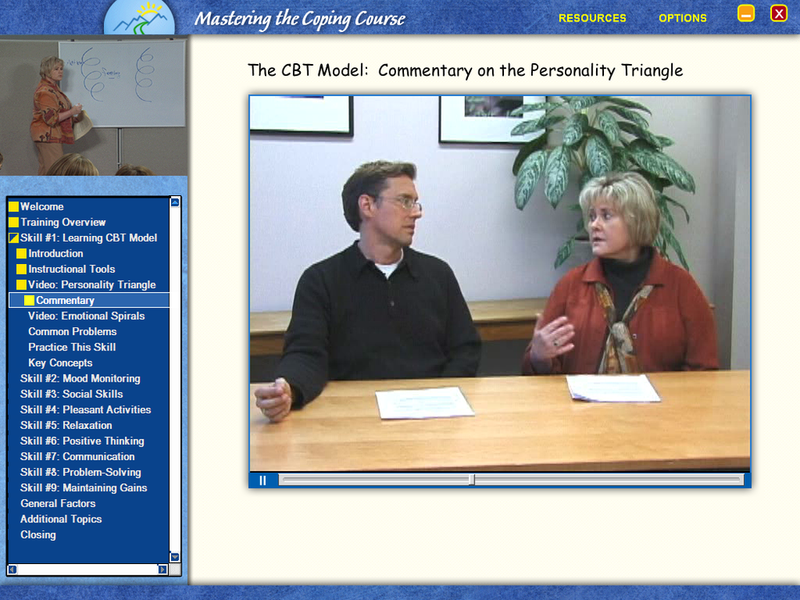 This step-by-step, interactive DVD-ROM training program incorporates video vignettes showing expert therapists (Dr. Rohde and his colleague Jenel Jorgensen, MFT) as they work with a group of depressed adolescents over multiple sessions. The flexible format allows users to choose which program components to view and the order in which course materials are examined. The Mastering the Coping Course DVD-ROM training program cross-references to the content in the Adolescent Coping with Depression Course leader's manual. The Mastering the Coping Course interactive leader training DVD-ROM provides sufficient support to enable Master degree level therapists to conduct the course. Additional and affordable training and consultation services are available, provided by Oregon Research Behavioral Intervention Strategies.